Quilt block number 10, the Sawtooth Star block and more importantly, one whole column’s worth of the final quilt! Not that these first 10 do actually sit in the same column but it is still an eight of the way there, all the same! It helps a lot that my lovely neighbour has subscribed me to the ‘Art of Quilting’. There is of course an obligation but it is the nicest kind of pressure! It’s becoming easier to recognise the order in which these block pieces should be assembled. I just find it a bit tricky knowing the best way to press the seams. It’s not always towards the darker fabric, as I thought. So I am still very much paying attention to the instructions for that advice. Hopefully that will become second nature eventually. To make this one, two smaller triangles were attached either side to the diagonals of the larger triangle to form a rectangle. Four sets of these were made. Two of these rectangles were sewn east and west side of the large central square. The smaller squares were attached each end of the other two rectangles, which were then sewn north and south of the block. As with most of the blocks that contain small triangles, there is a necessity to watch those points and keep those seams to exactly 6mm. I was very concsious of how much room there was for error in this one but took it extra slow. Well, for the duration of Little Miss Ooobop’s flute lesson, actually! History: This block gets it’s name from the triangles that are reminiscent of a saw’s cutting edge. It has appeared on very early quilts in the US, dating back to 1860. Wow!!!! I guess that I didn’t realize that you were such a quilter!!! Well done, can’t wait to see the finished quilt!!! They all look great! Lovely – I have done some quilting but only very simple stuff. It´s my “winter” project, so I´ll wait now until the end of the year to pick it up again but love all the stuff you have on here. Thanks Chica. Though I can’t claim all the credit. Am following strict instructions from the magazine! The Sawtooth Star is such a nice block. The big square in the middle is a great way to show off a pretty fabric, as your block demonstrates. Pingback: Sashing time! | ooobop! Pingback: The Windmill Sails block | ooobop! Pingback: Basket of Flowers quilt block | ooobop! Pingback: Susannah quilt block | ooobop! Pingback: Road to Oklahoma quilt block | ooobop! Pingback: Chequer Star quilt block | ooobop! Pingback: Nelson’s Victory quilt block | ooobop! Pingback: Fair and Square quilt block | ooobop! Pingback: Diamond Pinwheel quilt block | ooobop! Great Blog, love seeing your quilt blocks. Good Job. Pingback: Whirligig quilt block | ooobop! Pingback: Old Maid’s Puzzle quilt block | ooobop! 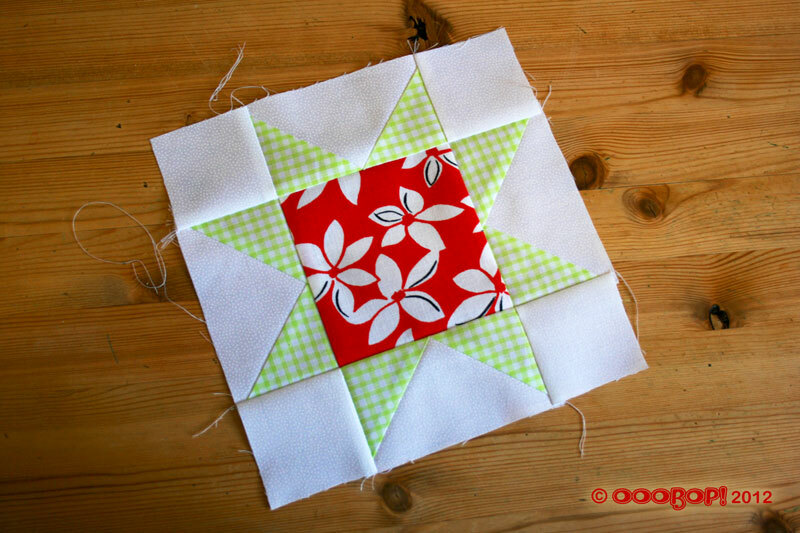 Pingback: Whirlwind Square quilt block | ooobop! Pingback: Windblown Square quilt block | ooobop! Pingback: Basket of Flowers quilt block revisited | ooobop! Next PostNext A certain night-attire ‘party’ sewalong!